David Shaw, Director of Communications for the Golden Gate National Parks Conservancy, (415) 561-3064. Mary Currie, Public Affairs Director for the Golden Gate Bridge, Highway and Transportation District, (415) 923-2222. What if the Golden Gate Bridge celebrates its 75th birthday and nobody can see it? The people who handle tourism on the iconic span are taking steps to ensure that a fog doesn't hang over their party this weekend. The Golden Gate Bridge was heralded as an engineering marvel when it opened in 1937. It was the world's longest suspension span and had been built across a strait that critics said was too treacherous to be bridged. San Francisco's iconic Golden Gate Bridge celebrates its diamond jubilee on May 27. The bridge has become much more than a means of transportation, it's become one of the most important modern monuments in the world. People travel from around the world to see the Golden Gate Bridge. Golden Gate Bridge Research Library. Facts and statistics. Golden Gate National Parks Conservancy Fact Sheet (PDF). 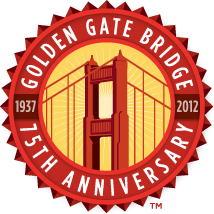 75 Ways to Celebrate the Golden Gate Bridge (PDF). Community Partners. Celebrations will be held throughout the Bay Area in 2012. Community Partners Present 75 Tributes to the Bridge. Schedule of Events and Programs. Dedicated GGB 75 YouTube channel.